Sadly it is really beginning to feel like summer is over around here. While the girls still have a few more weeks until their pre-k starts, lots of others are starting to go back. Our morning trip to the playground consisted mostly of the 5 and under crowd, a sure sign schools are back in session or soon will be. However, we are still holding on to summer for as long as we can and checking off one of the few items remaining on our summer bucket list, sidewalk paints. I am not sure why it took me so long to make these, because they are ridiculously easy to make and the girls loved playing with them. 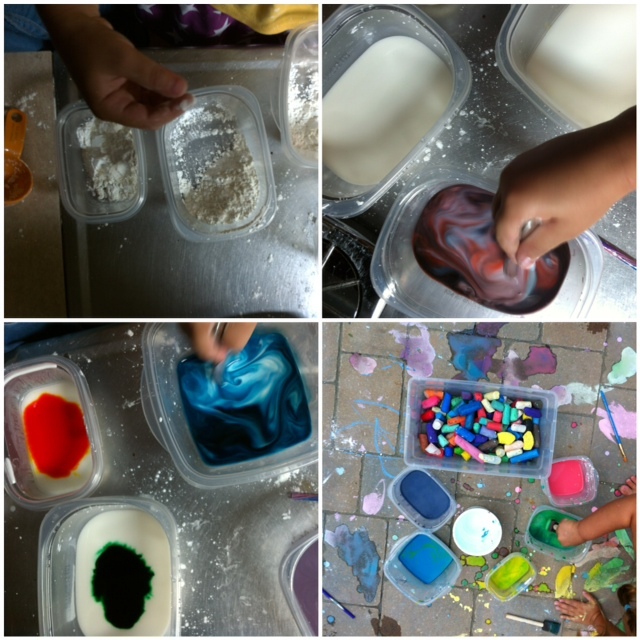 To make the paints mix 1/4 cup of cornstarch and 1/4 cup of cool water in a containers. I used separate plastic tubs for each color to minimize the fighting but I think any container would work. 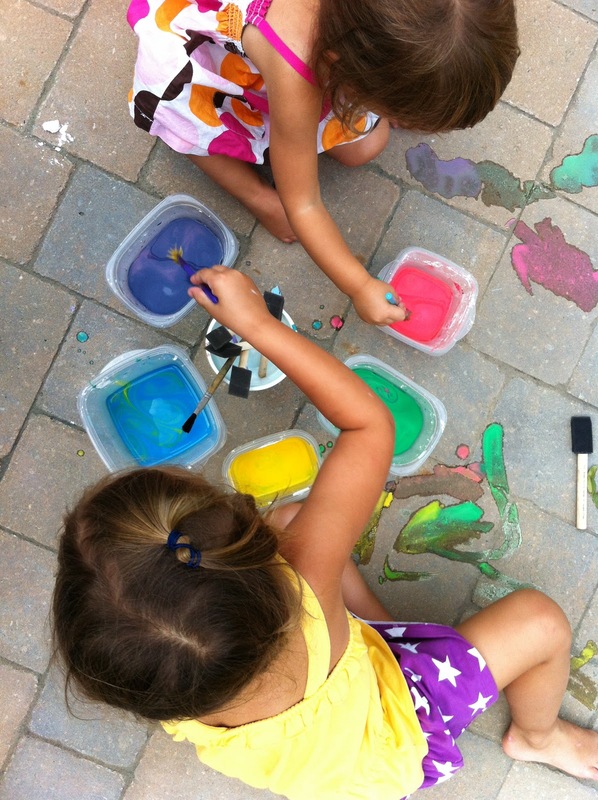 Then add a few drops of regular liquid food coloring to the mix and you are ready to paint. The Bee helped me make the paints, then we brought them outside with a bunch of different kinds of paint brushes we have. The girls quickly got started and had a blast painting, mixing colors and trying out all the brushes. 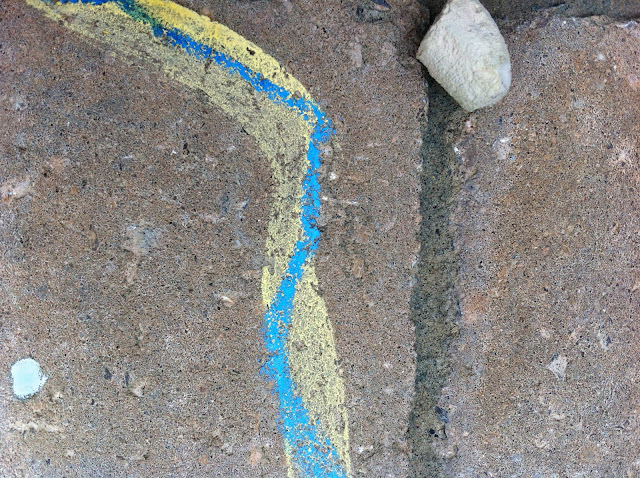 After a few minutes the Bee discovered that you could paint and then draw into the paint while it was still wet with sidewalk chalk to create a cool resist effect. 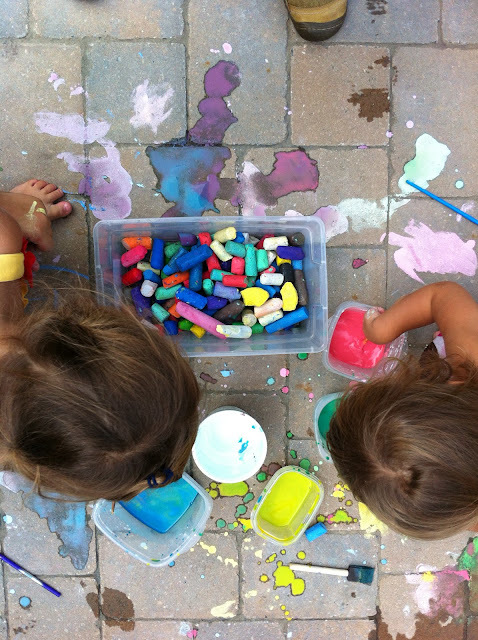 We spend a good part of the afternoon playing and exploring the paints. Unfortunately I left them out over night and by the next morning they had dried out but they were so easy to make I have no problem making them again for another afternoon.